For most students, the cost of a college education proves to be well worth the price. But why make that price higher than it has to be? By investing as much as you can long before freshman year, you can significantly reduce what you may have to pay back—with interest—for years after graduation day is over. The main advantage of saving early—and regularly—is to harness the power of compounding (when your investment earnings are reinvested and, in turn, generate more earnings). Add compounding to the benefits of investing in a tax-advantaged 529 college savings plan and you could realize even greater savings growth. 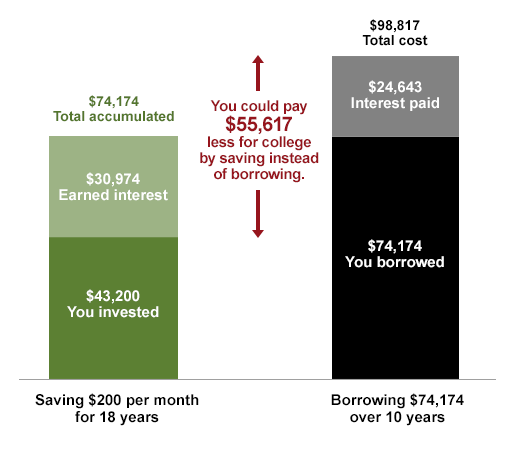 Plus, the more you save, the more you increase your potential to earn and the less you may have to borrow. Suppose you start saving $100 a month in a tax-free 529 plan when your child is born. In 18 years, assuming 6% average annual investment earnings, you could accumulate $37,086 to use for college expenses—$15,486 more than you actually invested and that you won't have to borrow. On the other hand, if you borrowed the same total amount—$37,086 at a 6% interest rate—it could take you ten years to pay off the loan. With a $411.73 monthly payment, your total amount repaid would be $49,408, costing you approximately $27,808 more than if you had saved regularly. When you increase the amount you save, the difference is even more noticeable. A monthly contribution of $200 over 18 years, for example, could grow to approximately $74,174, or $30,974 beyond your invested amount. *These hypothetical examples don't represent the returns on any particular investments, and the final account balances reflect no taxes or penalties that may be due upon distribution. It all boils down to this: The more you save, the more your money can work for you and the less you have to borrow and repay with interest. And even if your child is already a teenager, it is never too late to get started because every dollar you save is a dollar you won’t have to borrow. Think you may not have the discipline you need to follow through with steady contributions? Consider signing up for a recurring payment plan. It can create an automatic saving-for-college routine that requires almost no discipline at all. No matter what, if you save now, you will thank yourself later. Your child will thank you too. A plan of regular investment does not ensure a profit or protect against a loss.